My passion is to make photographs at every wedding that make the day unique. Simply put, I’m looking for “the moment.” That one split second, captured with the camera, that won’t ever be repeated. It might be the way the light is falling on a tear, a laugh, a touch of emotion, or that feeling within someone that resonates when looking at the photograph of the moment. I want to be surprised and give my clients that piece of the day that isn’t planned or something they didn’t notice. All photographers capture images of the wedding couple in an embrace, kissing, processing, recessing, dancing, cutting the cake, and the details. It’s all part of a wedding weekend and so important to capture. To compliment those images, I have to go after something more avant-garde, special and heartfelt. It’s what I crave every time I pick up the camera, whether it is an image of my daughter in the comfort of my own home or a wedding photograph at any one of the many exceptional locations world-wide. Here is just one of those moments and the story behind it. There are more to come. Natalie and Andrew were married at Veritas Winery and the sunset was very nice on this particular night. I was doing a few portraits with a hand-held light and while they were in a dip, the wind blew. My favorite part of this image is the little opening of space between the veil where I can see Andrew’s expression of joy. Veritas opened in 1999 when owners, Andrew and Patricia Hodson began with 5 acres of grapes. They now produce outstanding wines and are leaders in the central Virginia industry. They now have over 50 acres of Vineyard on site and have other sister properties such as the Farmhouse at Veritas. We’ve been lucky to work weddings there over the years and love the intimacy of that location as well as the larger scale events at Veritas. I would like to thank Patricia and Chloe for always welcoming us and being kind when we spend time documenting weddings at this beautiful property. It’s an outstanding example of why Charlottesville weddings continue to thrive. The beauty of this particular location along with its proximity, but out-of-the-way feel, is appealing to so many. 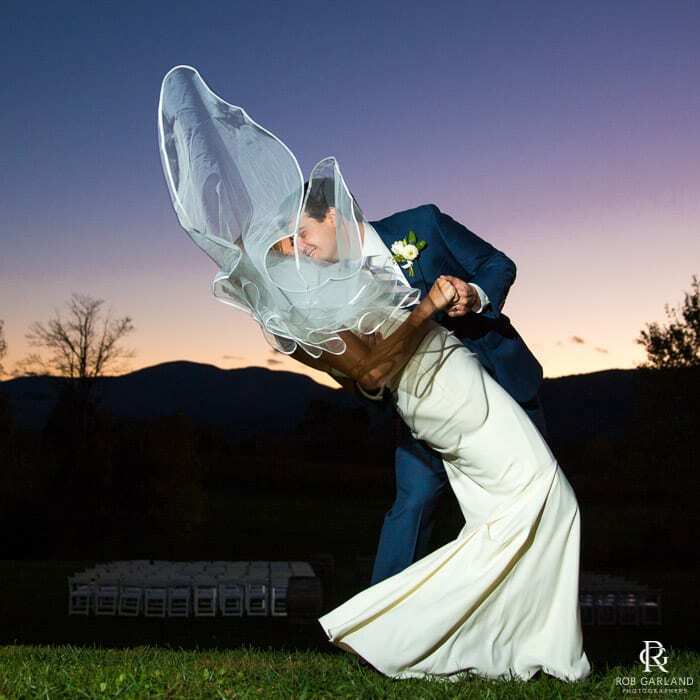 Charlottesville weddings that take place outside of the city provide such a wonderful escape but allow for guest accommodations by bus or private vehicle – in my opinion its one of the perfect approaches to a wedding in the area, allowing for the utmost in relaxation with stunning vistas. The view from the property allows for a perfect visual display of the sunset on any given night as you can easily see the western sky and the layers of vines in the not so distant foreground. The mountains certainly cap off such a magnificent landscape. If you have a chance to visit, definitely take time to wine taste and spend the afternoon walking the grounds. You will certainly be impressed. Enjoy!